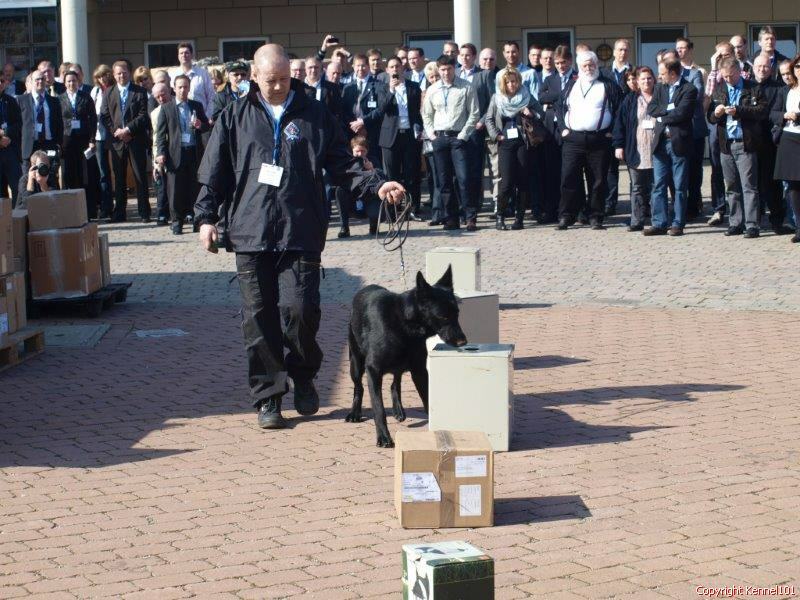 Explosive detection dogs are so important as never before! All over the world dependable security systems are tested and discussed. are demonstrable working slow and unreliable. Searches are often carried out only purely optically. The security risk continues to exist, but we are not helpless. trained dog leaders are a reliable alternative. 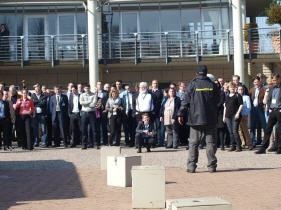 for detecting explosives, as well as in the private security area. 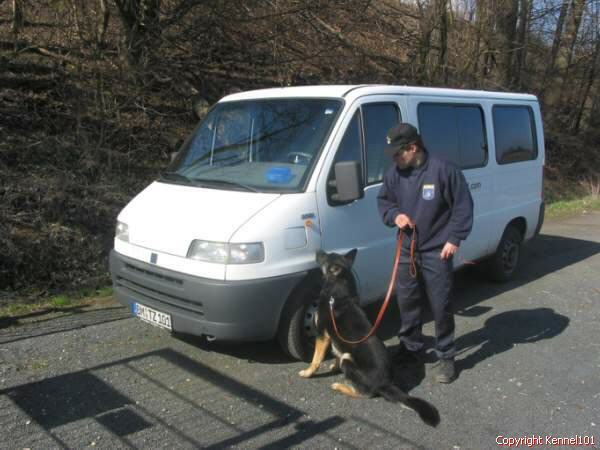 Nationwide explosive searching dogs are used for a long time by authorities. Security Explosive and bomb attacks are a real threat. They occur without warning and we are an easy target if unprepared. The bombdog is a reliable detector. The trained bombdog can work anytime in any location. This allows us to prevent a surprise attack. Obviously this reduces the probability of an attack. times questionable. The bombdog utilizing its scent abilities is predictably reliable. Bomb dogs have an excellent track record as witnessed by their current use with Police, Customs, Border Patrol and Military. if a new threat is presented by terrorist. 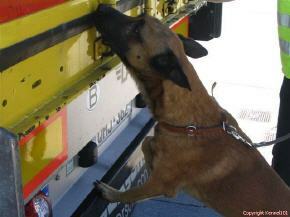 Efficiency bomb dogs can work as a much faster pace then a explosive dector machine. 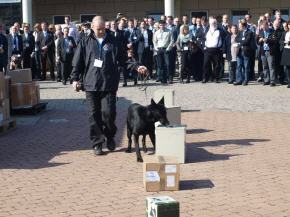 Bomb dogs are not only much faster then the machines but much more accurate. We always have multiple explosive dogs at the work site so we can work without the need of breaks while maintaining our excellent standards of security. This is accomplished by rotating our dogs throughout the search. Dogs do not require he highly technical form of maintaince like a explosive dector machine yet they can provide a 24 hour service when properly deployed. 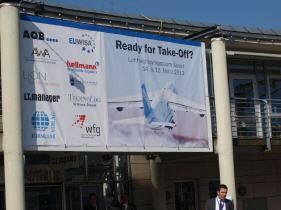 aircraft, vehicles, stages and podiums. Our bomb dogs are trained by experienced police canine handlers. military, commercial and self-made chemical components. as well as instruction on their handling and safety issues. We can provide target dates upon request. locally and in foreign countries. We would be glad to provide additional information and prices upon request. 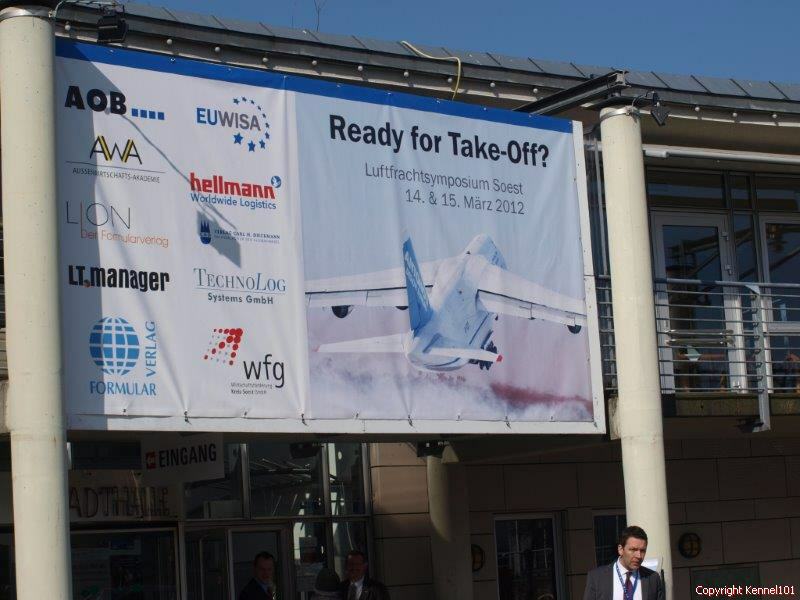 March 14th and 15th of 2012, the kennel 101 team was invited to the Air Freight Symposium in Soest. We had the opportunity to present our program. The affected carriers were very interested. Main topic was time and speed. 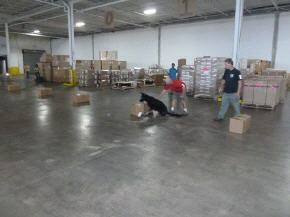 We could show how fast a detector dog can search a specific number of parcels and pallets. 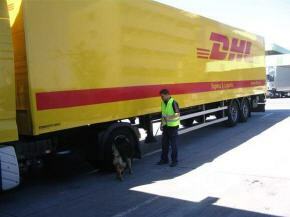 Projected onto the air freight capacity of some carriers, we hit unbeatable times. 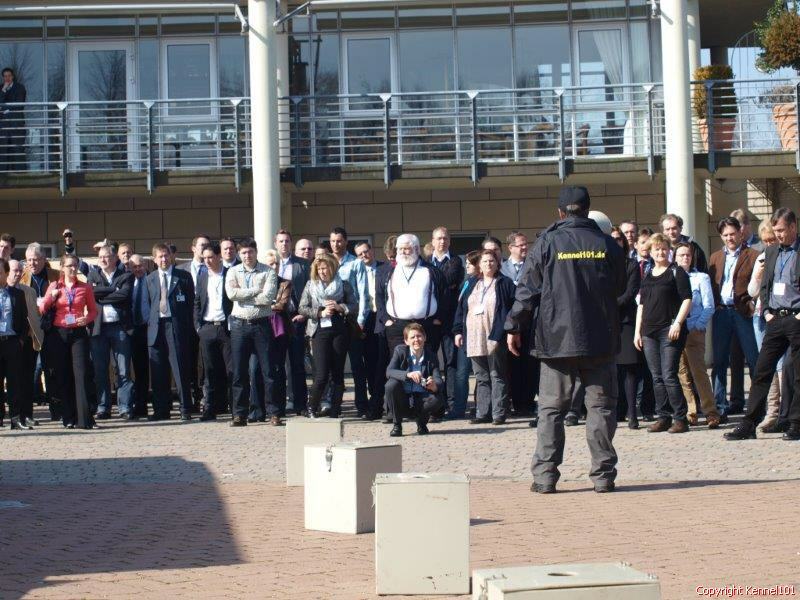 If a dog wants to become an explosive detection dog, it must pass a selection test. That goes along with a character test. The dogs on the pictures have no training so far. 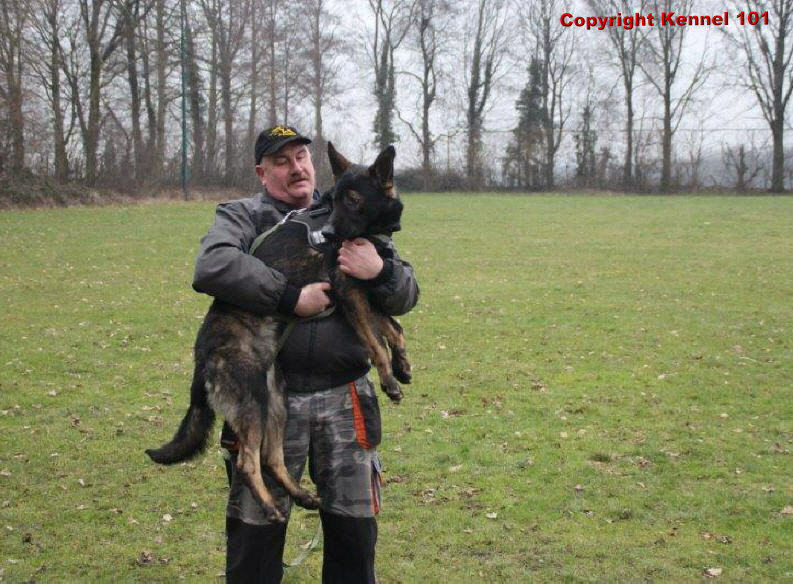 What you see is the usual test, if Kennel 101 Germany buys new dogs. Only high drive dogs with a very strong nervous system can pass this test. During the character test, a strange person will lift up the dog. The dog must be neutral and calm.